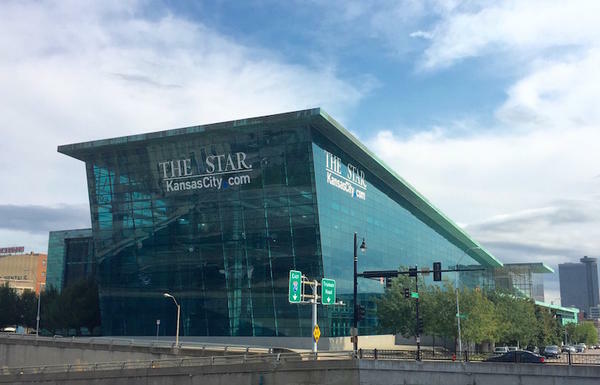 The Kansas City Star staff moved into the newspaper's Press Pavilion, pictured above, last July after occupying its historic quarters across the street for more than a century. McClatchy Co., the parent company of The Kansas City Star and the Wichita Eagle, is offering buyouts to about 10 percent of its workforce. It’s unclear how many employees at The Star, whose ranks have been decimated over the last decade by layoffs, buyouts and retirements, are eligible for the buyouts. But several employees who received buyout offers told KCUR they were considering the offers. The last round of reductions at The Star occurred in August, when McClatchy cut 3.5 percent of its workforce companywide. Just a few months earlier, in May, The Star laid off 10 newsroom employees. The Star's newsroom is now down to about 70 employees. Sacramento-based McClatchy owns 30 newspapers across the country. In addition to The Star and the Eagle, they include the Miami Herald, Charlotte Observer, Lexington Herald-Leader and Sacramento Bee. The workforce reductions at McClatchy are playing out against the backdrop of an unusually tumultuous time in the news business. Last week, more than 1,000 media employees received pink slips after a slew of media companies, including Gannett, Yahoo, BuzzFeed, HuffPost and AOL, announced sweeping job cuts. In the nine-month period that ended in September, McClatchy lost $52 million, compared with a loss of nearly $394 million a year earlier. The company has been going through a painful period of digital transformation and continues to labor under a high debt load, some of which it incurred in 2006 when it bought the Knight Ridder newspaper chain for $4.5 billion. Knight Ridder owned The Star. In his email, Forman pointed to gains in digital advertising and digital-only subscribers. “But – as always in a challenging business transformation – there is more to be done,” he wrote. The deadline to accept the buyouts is Feb. 19. Correction: The last round of cuts at The Star occurred in August, not May, as previously reported.